Our EverLast™ Finished Wall Restoration System provides a solution for homeowners who have experienced flooding in their finished basement. This wall system includes metal studs and an inorganic, mold-resistant wall product that replaces the bottom 32" of your home's drywall. An inorganic base molding and decorative chair rail make this an appealing, long-lasting solution that will keep your basement looking great! Installing the EverLast™ Finished Wall Restoration System includes cutting the existing drywall and studs beforehand. The new system cannot be installed until the drainage system has been installed. Once the concrete dries, the wall system is installed. The overall installation can be completed within a week. This wall system is a great way to protect your finished basement should you experience a futurebasement flooding. These durable wall panels will not be damaged by water, and their completely inorganic design will not support the growth of mold or mildew. Additionally, the EverLast™ Finished Wall Panels used in this system are fully washable, include a written warranty, and are strong enough to endure the daily wear and tear of a frequently used living space. This wall restoration system is fully compatible with our modern day basement French drain systems. Each system is installed with a vapor barrier behind it, to direct any moisture from the walls into your perimeter drain. It is also fully compatible with our basement flooring options. At Best Home & Property Services, we can repair the damage to your walls and floor with warranteed products at the same time we waterproof your basement! There's no need to call a separate contractor! 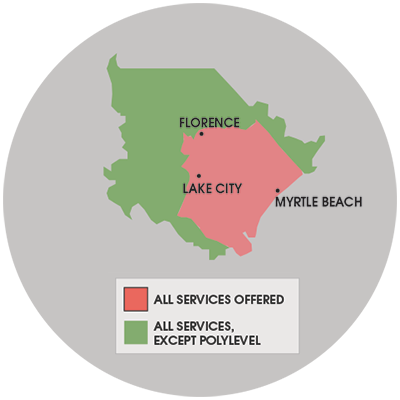 We service Manning, Marion, Dillon, Kingstree, Cheraw, Loris, Murrells Inlet and many nearby areas in South and North Carolina.